Scappoose. Draw them a map if you have to, don’t let them waste time! Call 911– stay on the line if possible, use a land line if possible. one has come to your aid yet. buckets and fire extinguishers everywhere in the marina. Use them as needed. direct fire trucks to emergency. possible. Evacuate all nearby people in homes or boats. arrive, or follow their instructions. that floating home owners need to be aware of and plan ahead for. lose many to theft every year, when we need them, they are not there. before and walk up the hill. snow without checking with the office first. warms. We will advise of a marina closure, should the threat of environmentalcontamination become possible. It would be very rare for this to happen, if everyone follows these guidelines and keep the water moving! ropes and chain pulleys in emergency sheds. Contact office. you can, if not toss them something that floats, and begin yelling for help immediately. off of a boat to help pull them in. the water may have very few minutes. pads/socks in your bilge at all times while in marina waters. Contact marina office with slip location, type and size of boat and how badly it is sinking. located in the emergency sheds. The fire pumps can be used, especially for bigger needs. The fire buckets can be used as well to bail out boats. power cord. Many times power gets accidentally unplugged causing batteries to go low. Simply plugging back in will activate the onboard bilge pumps. the parking lot is 20ft. calculated in the predictions from NOAA. license plate and description of the vehicle with the office staff to avoid be towed. roadways are part of the truck weigh station and must be kept clear at all times for trucks. Portable signs will be placed by Rocky Pointe Marina as the appropriate areas to park. located in front of the office. Fire buckets-Fire extinguishers. 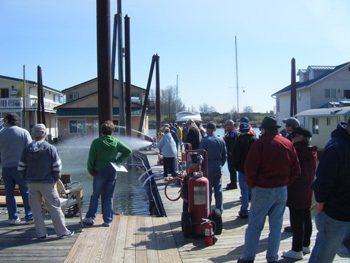 There are over 50 marina fire extinguishers on the property and another 50 or more as each floating home and boathouse is required to have one visible from the dock. Feel free to use any that you find. 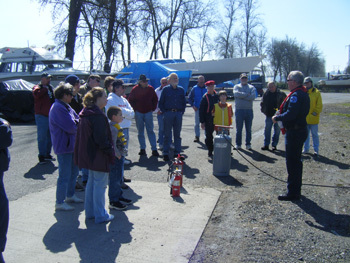 All extinguishers are checked and service annually by a certified company during early spring. If you notice an extinguisher not in working condition, please bring it to the office for immediate service or replacement. Water hoses are available for use as well. offers an annual group event focusing on new tenants but all are welcome to come.